So what is PHP anyway? PHP (recursive acronym for PHP: Hypertext Preprocessor) is a widely-used open source general-purpose scripting language that is especially suited for web development and can be embedded into HTML. That’s the official definition, but in simpler terms, it is an open source (i.e. free), supported coding language that allows development teams (programmers) to create dynamic Web applications (websites, apps,) for clients. If you want to learn more and really dig into the topic, check out the official PHP site for documentation and user forums on PHP. Preform calculations. It can figure out the day of the week or help solve equations needed for a website. Plus, the site can be changed in real time. Collect user information. PHP provides a way for users to interact directly with the applications that affect the site. You can do something really simple like add information to a form such as name or email. It works behind the scenes to build more complex things such as articles or blogs. Interact with MySQL databases. It makes websites dynamic to allow you to send information from the user to the database, and then retrieve it. This is just a summary of PHP to make you conversant, but PHP can do many other things as well. Ultimately, the true value of PHP is the ability to build websites in a dynamic manor and make changes on the fly-giving users a better experience overall. 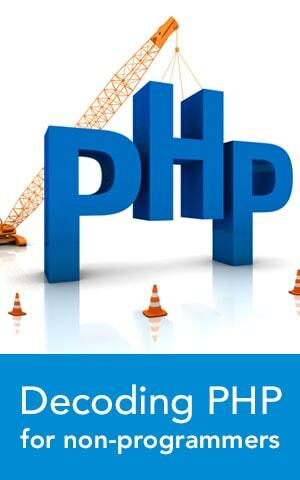 For further reading if you would like to delve into the exciting world of PHP programming visit (www.php.net/).